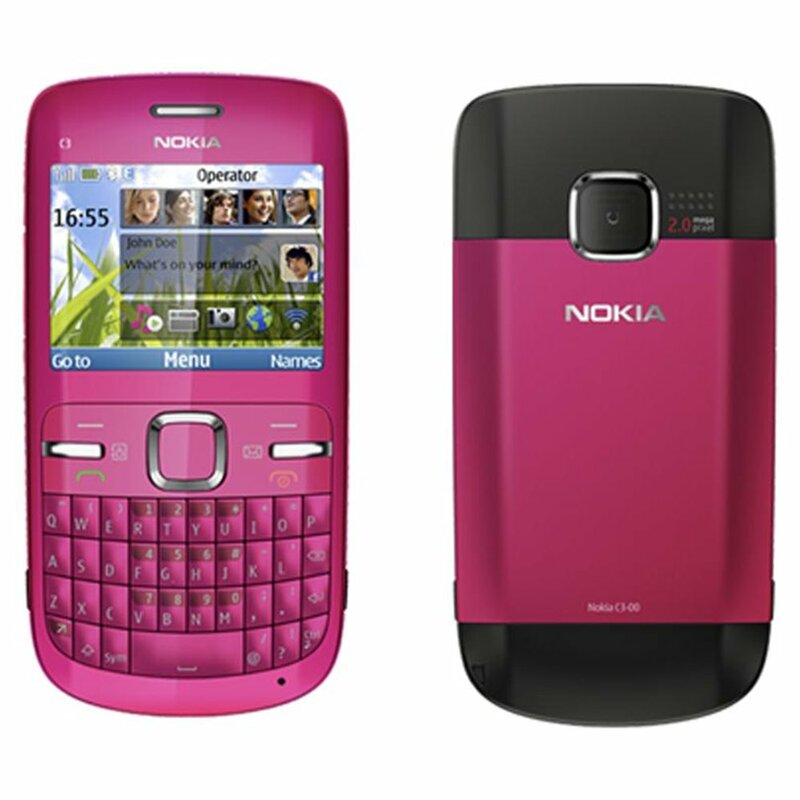 Nokia c3-oo was released in June 2010 and is a QWERTY bar feature mobile phone running on Nokia S40 operating system and is made mainly for messaging and social networking. 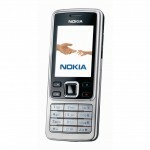 The phone belongs to the Nokia C series and is the predecessor to Nokia E63 and the successor of Nokia Asha 302. The device weighs about 87.7g and has an internal memory of 55MB which is also extendable up to 8GB. 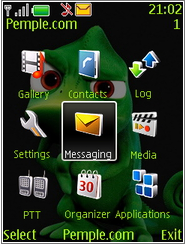 In this post we are having a look at top ten free themes for Nokia c3-00 that can make your phone attracting. 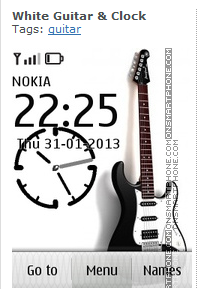 The theme features a guitar and a clock placed in white background. The most parts of both the clock and the guitar are black and so is a nice color combination. The theme comes under the category of music and audio since it shows the guitar. To download the theme, click here. This theme shows a picture of the Paris including the famous observation tower, Eiffel. The theme stays so close to the nature depicting leaves, trees, sky and river and so the theme is categorized under nature and cities. It is best if you are looking for a theme that will make you pleasant and happy. You can download the theme by clicking here. Card Danbo is an animated theme that displays a robot made of cardboard boxes. The menu page of this theme is very beautiful and shows some lights in a blurred mode. The theme has a file size of about 1.24MB and is in the Drawn / Design category. The theme can be downloaded from this link. The Windows 8 Pro theme features the metro user interface and is really beautiful as the real Windows 8 appearance. It displays the date in a block along with event list; also each icon is shown in a block. The theme is of 222kb and can be downloaded from here. 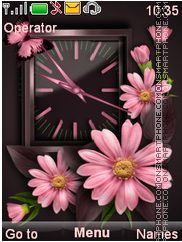 The flowers theme displays a wooden framed analog clock along with some pink flowers. The flowers are of different size and there is a butterfly too of pink color itself. The theme has a size of 279Kb and is available for download from here. 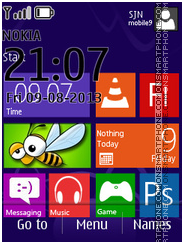 Windows 7 theme for Nokia c3 has a beautiful landscape in which an island is there on the sky. 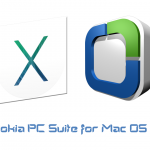 The inner background of the theme is same as that of the Windows 7 log-on screen. It is categorized under Technology or Software section and you can download it by clicking here. The theme features minions and is an animated theme. The theme includes icons, animations, a digital clock and other elements. 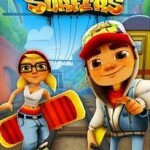 The theme is prefect and is very funny as per the users. You can click here to download the theme. It shows a background which really creates a romantic mood in us. The background image has a nice sky and a sun in it. You can download the theme by clicking here. The theme features a reddish leaf and a water drop on it. It can be considered as an abstract theme. It has an awesome look and click here to download it. A green lizard is being featured on this nice looking theme with black background. It comes under the category of cartoon or animal and you can click here to download the theme. 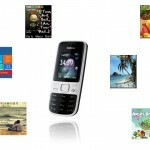 I hope this great collection will help you in choosing a best free theme for Nokia c3-00 device.